Enthusiastic auds welcome first Western tuner. Bare midriffs were out. So was the word "gay", although it was OK to say a character was "into guys". The words "God" and "damn" could be used, but not together. 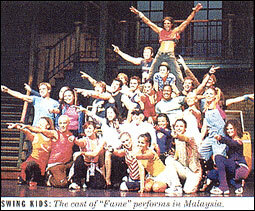 With such minor tweaking, "Fame" became the first full-scale Western musical ever staged by Western producers in Malaysia last month. And audiences loved it. The tuner played May 9-26 at the 1,400-seat National Theater in Kuala Lumpur, co-produced by Aussie firms Jacobsen Entertainment Group and Intl. Management Group. The first week was close to capacity, and while Rodney Rigby, director of theatricals at JEG, declined to reveal exactly how many of the 29,000 tickets available for the 22 perfs were sold, he said attendance was "above expectations." While he said the season did return to surplus, he attached greater importance to the fact that the event has created a "bed" that will encourage more producers to include K.L. in their Asian tours. Indeed, IMG and Really Useful Co. are planning to stage the venerable "Cats" in Malaysia in October. And Jacobsen aims to take one show per year through Asia, including K.L., from 2004 probably kicking off with "Jekyll & Hyde". The Malaysian Ministry of Culture served as co-presenter of "Fame" to help persuade over seas producers to see the National Theater as a viable venue. The tuner - using the cast and helmer David Atkins from the Australian production of 1999-2000 - then moved to Hong Kong, where it ran June 6-23. The tour winds with 14 perfs in Singapore July 4-14. "Fame's" N.Y.-based creator David De Silva was on hand for the Malaysian season and its Hong Kong Preem. And he was ecstatic with the responses in both cities. "In a world that's becoming more divided, it's great that a show like 'Fame' is able to cross cultural boundaries with positive messages for young people." he tells Variety. "The actors told me that Malaysian audiences were the most intense and riveted in their response to the show that they as performers had ever experienced." There were minor revisions to avoid giving any offense to the predominately Muslim audiences. For example, lyricist Jacques Levy penned new lyrics especially for the occasion, changing the ditty "Can't Keep It Down" (when she's around) to "Can't Keep It Cool" (when she's in school). The king and queen of Malaysia, Prime Minister Mahathir and sundry sultans attended the black-tie opening night. The National Theater's dress code precludes T-shirts, so batik shirts were provided to audience members who needed covering, De Silva said. Rigby lists the all-in cost of staging the Asian tour at A$6 million ($3.3 million) and says the producers expect to make a profit. The average ticket price was $50 in Malaysia and $57 in Hong Kong. Opines De Silva: "Judging by the power of 'Fame' to reach Muslim and Chinese youth with its passion and inspiration, I think the U.S. State Depart. should be sending the show to cities like Cairo, Istanbul, Jakarta and Beirut. It really can make a difference".